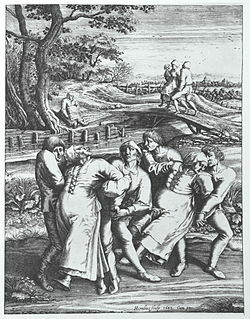 The dancing plague (or dance epidemic) of 1518 was a case of dancing mania that occurred in Strasbourg, Alsace, (now modern day France) in the Holy Roman Empire in July 1518. Around 400 people took to dancing for days without rest and, over the period of about one month, some of those affected collapsed or even died of heart attack, stroke, or exhaustion. The outbreak began in July 1518 when a woman, Mrs. Troffea, began to dance fervently in a street in Strasbourg. This lasted somewhere between four and six days. Within a week, 34 others had joined, and within a month, there were around 400 dancers, predominantly female. Some of these people would die from heart attacks, strokes, or exhaustion. One report indicates that for a period, the plague killed around fifteen people per day. However, the sources of the city of Strasbourg at the time of the events did not mention the number of deaths, even if there were fatalities. Historical documents, including "physician notes, cathedral sermons, local and regional chronicles, and even notes issued by the Strasbourg city council" are clear that the victims danced. It is not known why these people danced, some even to their deaths. As the dancing plague worsened, concerned nobles sought the advice of local physicians, who ruled out astrological and supernatural causes, instead announcing that the plague was a "natural disease" caused by "hot blood". However, instead of prescribing bleeding, authorities encouraged more dancing, in part by opening two guildhalls and a grain market, and even constructing a wooden stage. The authorities did this because they believed that the dancers would recover only if they danced continuously night and day. To increase the effectiveness of the cure, authorities even paid for musicians to keep the afflicted moving. The strategy was a disaster; after those policies were applied the illness underwent a dramatic growth. Performing dances in more public spaces facilitated the spread of the psychic “contagion”. Historian John Waller stated that a marathon runner could not have lasted the intense workout that these men and women did hundreds of years ago. Modern theories include food-poisoning caused by the toxic and psychoactive chemical products of ergot fungi, which grows commonly on grains in the wheat family (such as rye) that was used for baking bread. Ergotamine is the main psychoactive product of ergot fungi; it is structurally related to the drug lysergic acid diethylamide (LSD-25), and is the substance from which LSD-25 was originally synthesized. The same fungus has also been implicated in other major historical anomalies, including the Salem witch trials. However, Waller in the Lancet argues that "this theory does not seem tenable, since it is unlikely that those poisoned by ergot could have danced for days at a time. Nor would so many people have reacted to its psychotropic chemicals in the same way. The ergotism theory also fails to explain why virtually every outbreak occurred somewhere along the Rhine and Moselle Rivers, areas linked by water but with quite different climates and crops". Waller speculates that the dancing was "stress-induced psychosis" on a mass level, since the region where the people danced was riddled with starvation and disease, and the inhabitants tended to be superstitious. Seven other cases of dancing plague were reported in the same region during the medieval era. This could have been a florid example of psychogenic movement disorder happening in mass hysteria or mass psychogenic illness, which involves many individuals – small groups to almost 1000 people – suddenly exhibiting the same bizarre behavior. The behavior spreads rapidly and broadly in an epidemic pattern. The sufferers are primarily adolescent females. This kind of comportment could have been caused by the elevated levels of psychological stress, i.e. the despair caused by the intensely ruthless years (even by the rough standards of the Middle Ages) the people of Alsace were suffering. This psychogenic illness could have created a chorea (Greek khoreia or “to dance”), a situation comprising random and intricate unintentional movements that flit from body part to body part. Diverse choreas (St. Vitus' dance, St. John's dance, tarantism) were labeled in the Middle Ages referring to the independent epidemics of “dancing mania” that happened in central Europe, particularly at the time of the plague. ^ a b c Viegas, Jennifer (1 August 2008). "'Dancing Plague' and Other Odd Afflictions Explained". Discovery News. Discovery Communications. Archived from the original on 13 October 2012. Retrieved 6 May 2013. ^ a b Waller J (February 2009). "A forgotten plague: making sense of dancing mania". Lancet. 373 (9664): 624–625. doi:10.1016/S0140-6736(09)60386-X. PMID 19238695. ^ Clementz, Élisabeth (2016). "Waller (John), Les danseurs fous de Strasbourg. Une épidémie de transe collective en 1518". Revue d'Alsace - Fédération des Sociétés d'Histoire et d'Archéologie d'Alsace. 142: 451–453. ^ Waller, John C. (September 2008). "In a spin: the mysterious dancing epidemic of 1518". Endeavour. 32 (3): 117–121. doi:10.1016/j.endeavour.2008.05.001. ISSN 0160-9327. PMID 18602695. ^ Waller, John (2009). "A forgotten plague: making sense of dancing mania". The Lancet. 373 (9664): 624–625. doi:10.1016/S0140-6736(09)60386-X. PMID 19238695. ^ "Mystery explained? 'Dancing Plague' of 1518, the bizarre dance that killed dozens". 13 August 2008. Retrieved 3 July 2017. ^ Kaufman, David Myland; Milstein, Mark J. (2013). Kaufman's Clinical Neurology for Psychiatrists. Chapter 18: Involuntary Movement Disorders (Seventh ed.). Elsevier. pp. 397–453. ISBN 978-0-7234-3748-2. ^ Cardoso, Francisco; Seppi, Klaus; Mair, Katherina J; Wenning, Gregor K; Poewe, Werner (July 2006). "Seminar on choreas". The Lancet Neurology. 5 (7): 589–602. doi:10.1016/S1474-4422(06)70494-X. PMID 16781989. ^ Haq, Ihtsham U; Tate, Jessica A; Siddiqui, Mustafa S; Okun, Michael S (2017). Youmans and Winn Neurological Surgery: Clinical Overview of Movement Disorders (Seventh ed.). Elsevier. pp. 573–585.e7. ISBN 978-0-323-28782-1. ^ Kaufman, David Myland; Geyer, Howard L; Milstein, Mark J (2017). Involuntary Movement Disorders (Eighth ed.). Elsevier. pp. 389–447. ISBN 978-0-323-46131-3. Backman, Eugene Louis (1977) . Religious Dances in the Christian Church and in Popular Medicine. Westport, CT: Greenwood Press. ISBN 978-0-8371-9678-7. Waller, John (2008). A Time to Dance, A Time to Die: The Extraordinary Story of the Dancing Plague of 1518. Thriplow: Icon Books. ISBN 978-1-84831-021-6. Waller, John (2009). The Dancing Plague: The Strange, True Story of an Extraordinary Illness. Naperville, IL: Sourcebooks, Inc. ISBN 978-1-4022-1943-6. "Dancing death" by John Waller. BBC News. 12 September 2008. "The Dancing Plague of 1518" by Doug MacGowan. Historic Mysteries. 28 June 2011.